Jumbled Sunshine: Day 8: Toys and Board Games! Day 8: Toys and Board Games! Lesson learned: Taking little baby steps moves you forward, no matter how slow of a pace you take, and no matter how many times you fall down. "Just take two steps forward and one step back, and you'll go a long, long way." (see the music values series for children: "Standin' Tall by Janeen Brady") But enough philosophizing. . . 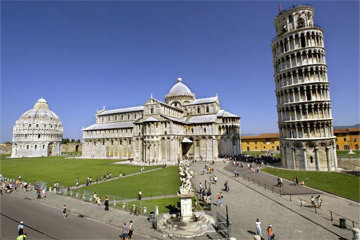 I know your next question: "Why is there a picture of the "Leaning Tower of Pisa" at the beginning of this blog post? Answer: Read on to find out!! Isn't that fun? A mystery! hee hee. I will be honest about this - I have been avoiding the Power Purge: Day 8 Challenge like the plague! And yet at the same time, I was really excited about the day that I would finally have the COURAGE to tackle it! Now, luckily for me, I didn't have to worry about TOYS, because at my house, well, we really just don't have a lot of toys left. Since my kids range in age from 8 to 20, we don't have a toy room anymore, just a little basket of preschool-type toys for kids who visit, plus a few miscellaneous toys in the rooms of my two youngest. So - my focus has been, and still is, THE GAMES. "May the odds be always in your favor!" (random thought, sorry!) So anyway, this "week" is the "day" to re-organize the board games! 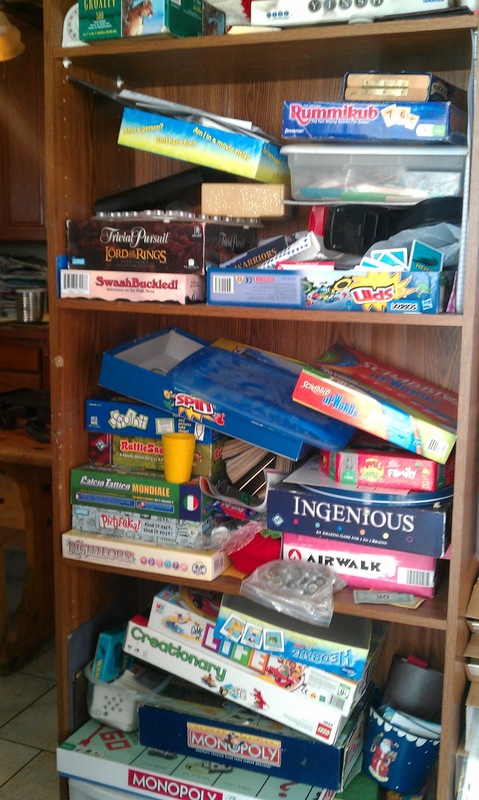 I say "week" instead of "day" because, you see, after 20 years of buying, gathering, playing, organizing, storing, putting away, scattering, destroying, fixing, re-organizing, and playing some more, our board games have gotten a little rough around the edges! But I knew we needed to organize them again - we've needed to ever since our last move. We've made a few attempts at getting them organized again, but never back into good shape in a place that really makes sense. Anyway, when we moved back to Utah in 2009 (yeah, I know it was only one year, that is a long story for another day), I put all the game containers in a closet in the basement that I thought would be relatively convenient, but apparently it wasn't, because the games rarely got used, except just enough to get taken out a couple dozen times and completely mixed up. And due to a multitude of health issues over the next several years (another long story for another day), I just never had the energy to even walk down the stairs, much less think about re-organizing the games. SO - that's my excuse. Enough about the excuse! On to victory!! The way I had things set up really is a great way to organize games, as long as you don't move 12 hours away and back in one year, have the cabinet break, and spend 5 years in bed. . . (or even if you do!). The main principle is that games have to be EASY to put away. (Learn more about this principle in Christy Youd's book: "Organize Your Home in 10 Minutes a Day"). But you know how it usually is with games, right? They come in these awesome little boxes with all the brand new pieces and they are a lot of fun to open and smell the newness, and they are so cute and fun to play . . . Yes, this is our actual game shelf a few days ago. Do you feel better now? The problem with storing games like this is that if they aren't put back perfectly every time (with the larger boxes on the bottom, smaller boxes on the top, etc), they need to be completely re-organized and re-stacked at least every month or two, otherwise it will get worse. Much worse. Trust me on this. Now tell me one thing: How easy is it for kids to put away the games when they are stacked like this in a leaning tower of Pisa fashion?? (ah-ha! The Leaning Tower of Pisa reference! hee hee) Seriously, how easy is it to put the games away when they look like this? What is the incentive to put a game away properly when all the rest of the games look like this? Answer: It's not easy at all, so the cycle continues. . . pieces get shoved on every shelf, boxes get further crushed, and no one ever plays the games and you end up eventually throwing them out because you have no idea where any of the pieces are, right? The challenge is this: How can you make the games easier to put away than it is to get them out? 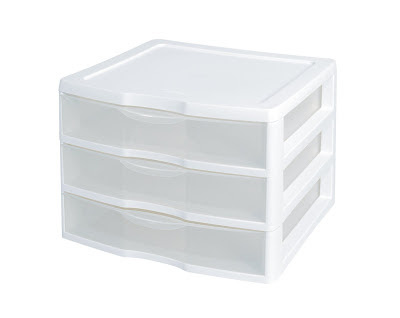 The basic principle is to make all the game containers the SAME SIZE and have them in sliding removable drawers so they are easy to get out, and easy to put away. And all games can go in any slot, so there's no need to be hyper-organized or anything. But you're wondering about the game boards, aren't you? 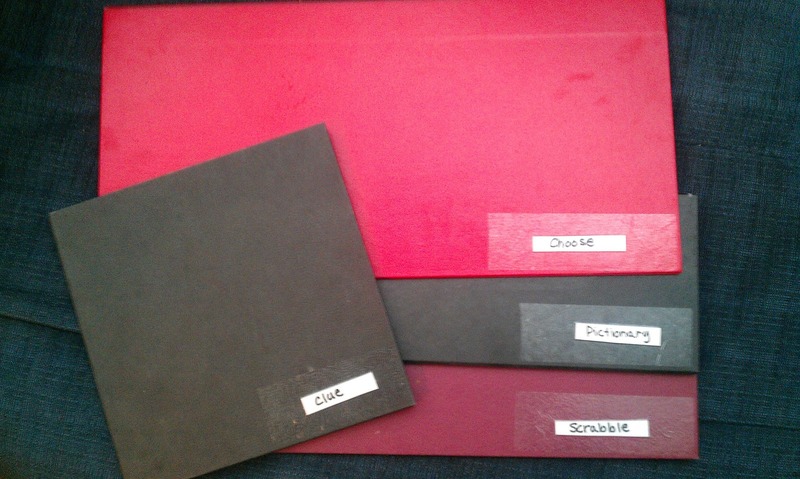 Label the boards with written or typed labels, then cover with plastic packing tape to secure. When it's time to play a game, the kids simply slide out the entire drawer of the game they want, grab the corresponding board, which takes only a few moments to find, because you have labeled them on the outside (and besides, kids will hunt for a moment longer to get out the game, it's the putting away that has to be the most simplified, right?) And then . . . PLAY TIME! When the game is over, the kids throw all the pieces back in the drawer, slide it back into the slot, fold up the board and put it on top, and it's done! Voila!! No more broken boxes! Yay!! My personal adaptation is that brand new board games get to stay in their box at first. This is because I can't stand to destroy a perfect little brand new game box. As long as the game is well taken care of, it can stay in it's nice little box, stored on a shelf near the game system. When the box starts to get destroyed &/or the game isn't being put away well anymore, then it goes into the system. That way, you don't have to feel guilty about destroying that awesome little brand new box for new games! Yay! One last thing: Here's another alternative from Hannah Keeley that follows the same principle that I use, but would take less investment in containers and might work better for games with those giant pieces that can't fit in the smaller drawers. Hannah's system uses large ziplock baggies to store all the pieces for every game, including the board. It doesn't look as neat and tidy, but it's sure better than how most families' game areas look after a few years of kids going at them!! I think I am going to store my games with giant pieces in larger baggies like she shows here, and store them all in a box in the cabinet under my game container shelves. That's it! Is that awesome or what?!? 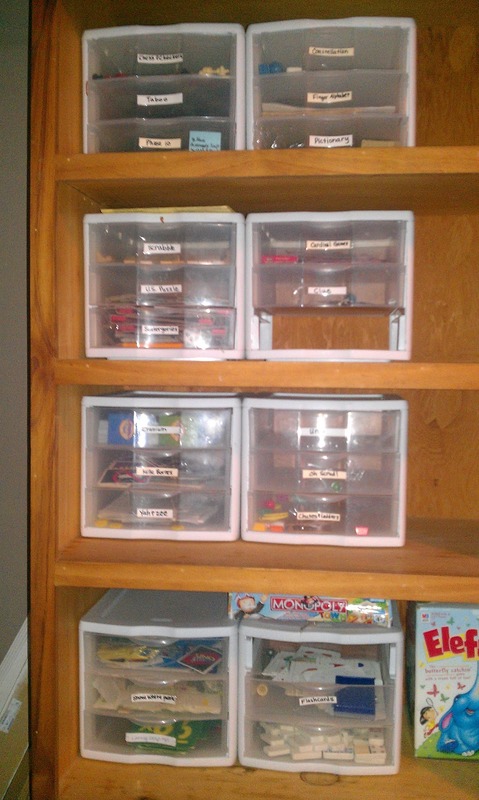 Does it make you really excited to get all your games organized? I hope so! If not, that's okay, just file this away in your memory for the day that it sounds interesting to you. I will continue working on my game organization and hopefully I'll post some awesome pictures when it is all completed. Oh - and one last little piece of advice - make sure the game shelves are located near a good playing place with a good table or playing surface that Mom and/or Dad walk past often - this will help prevent your game shelves from turning into a chaotic mess like mine did when I had health issues and rarely went near the game closet downstairs for a couple years! It Runs in the Family. . .
Jumbled Sunshine to the Rescue! Day 23. . . er. . . Day 11. . . er. . .